Join the discussion on our forums! Come discuss Witchwood Apple over in our dedicated Witchwood Apple discussion topic. 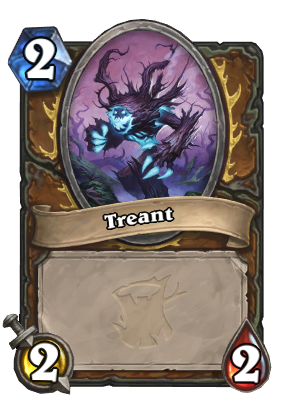 Add three 2/2 Treants to your hand. An apple a day keeps the worgen at bay. I feel like a nice change for this card so that it would see more play would be to make the treants 1 mana, essentially making it a 5 mana 6/6 instead of an 8 mana 6/6. In a way it would be a psuedo Force of Nature that doesn't create instant board presence unless you have the mana to play all of them. And if that proves to be too strong for whatever reason blizz could just nerf the apple to 3 mana. This card actually works well in my Even Token Druid. I can cast it when I have extra mana, and it can sometimes support Wispering Woods. if it were a two mana 2/2 treant, battle cry add two copies of this to your hand, it might see play. This is just terrible the way it is. I don't think this card will see play you first pay 2 mana to fill your hand with 3 cards and those 3 cards are just 2/2 that cost 2 mana to play. It is just to expensive and there are in my opinion quite some cards that have more value then this card. Not sure if he's right or not, but Purple just mentioned that these are 1 mana 2/2's. Which is the same as Force of Nature but you can choose when to play them and fill in your mana curve. Seems pretty good but probably still not playable without more synergy to the new Hand Druid mechanics. Nvm. Confirmed 2 mana Treants. Worse Force of Nature unless Hand Druid actually becomes a thing. [ Webweave ]: "Brother......is that....you?..." Its not nerfed version of Force of Nature actually. You can't summon 2/2's before turn five unless you are playing this card. This card allows you to play your treants on turn three and four. 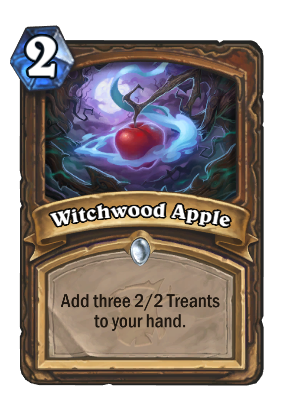 I can't say if Witchwood Apple better or worse here but the nerf thing has nothing to do with it. Art for the Treant token. This link, assuming it is legit, proves that the added Treant cards WILL COST 2! Thanks for telling us what the picture says. It's hard to click on links sometimes. Then you have to look at the mana cost and creature costs. Thanks for also telling us that it might be wrong, and that we should check an official site, perhaps the hearthstone official facebook, to see if this is the actual tokens or not. This is what I like to see in the community. God that was hard to right. They'll most likely cost 2. Thanks to the person above who posted the picture of the tokens, they cost two mana. rip. Atleast the art of the treants look cool.